“One of our biggest sellers was a surfing album. I guess we got tagged with that – Pipeline and Wipe Out we are associated with – so suddenly we are a surf rock band! I see that written a lot. But I don’t care. I’m used to it. We’re not just surf”. Band members have always denied their music being founded in the surf sound, but it’s certain The Ventures had a profound affect on it. It could be they’ve always refused to be labeled surf just as much out of deference to the artists who truly are surf bands as much as the facts. It’s also true that The Ventures went far beyond any one genre-expect being instrumental. They’ve also maintained keeping current with putting their sound to current music. Aside from their top-knotch playing it is these two other factors that have kept them in the world’ public eye for decades. So off they went to a Tacoma pawnshop where both of them bought very cheap guitars. They say the guitars were less than $10 each. Over the next few months the two practiced every moment they had between jobs…and they were frequently out of work. Soon the two were making the rounds of local bars, house parties and any other gig they could find. 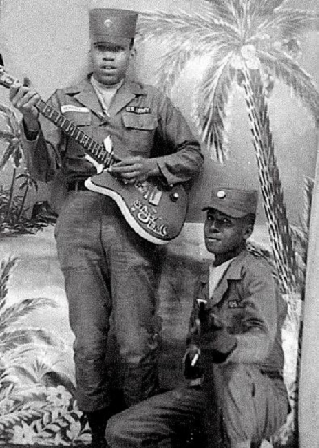 By the time Nokie had joined Owens band he was already a known as a regional virtuoso guitar player. He’d played professionally since he was 17 and managed to make a very good living with many gigs paying up the $350 a week. By the time Bob Bogle and Don Wilson lured him into with them he was certainly taking a big financial hit. This wouldn’t be Wilson’s mothers’ only contribution to the band. After The Ventures had shopped around for a recording contract (and failed) Josie Williams founded Blue Horizon Records, and arranged studio time at Joe Boles legendary West Seattle studio Custom Recorders. The Ventures recorded their first single “The Real McCoy b/w Cookies and Coke” with Boles. Josie wrote the lyrics to Cookies and Coke and produced both sides. The single was a flop, but it wasn’t long before Josie booked more time at Custom Recorders and Walk-Don’t Run” was recorded. Bogle played lead guitar with Wilson on rhythm, Edwards on bass, and Skip Moore on drums . The tiny label pressed up only 300 copies, and distributed them locally. Unfortunately for Moore, he had decided to leave the band and work for his father’s gas station. He agreed to be paid $25 for his work on the recording instead of a royalty sharing deal…a mistake that would deprive him of royalties even after a lawsuit a few years later. Moore was replaced by drummer George T. Babbitt, Jr., but at 16 he was too young to play bars and taverns The Ventures were often hired to perform in. Finally the band hired Howie Johnson in order to go out on tour in support of their major hit and new-found popularity. In the fall of 1961 he was involved in a car crash, causing him irreversible spinal damage. Johnson managed to play drums while wearing a neck brace. Beside touring he drummed on the first four Ventures albums and half of the tracks on the fifth LP. He ended up quitting in order to spend more time with his family and occasionally played locally throughout the rest of his life. Josie Wilson pushed Walk-Don’t Run day and night to anyone who would listen. Out of the blue local entrepreneur, DJ and radio station owner Pat O’Day started using a portion of Walk-Don’t Run as a “kicker” (intro) to his newscasts on his wildly popular radio station KJR. Listeners wanted to hear more, so KJR put the entire song into rotation. Soon legendary Seattle label Dolton Records were beating a path to Josie’s door to pick up The Ventures’ contract. The irony was not lost on Josie and the band that they had previously auditioned for Dolton, but had been turned down. Though Dolton heads being a bit embarrased theywent on to re-release Walk-Don’t Run on their label. At the time Liberty Records was their distributor so Dolton licensed the rights to the much bigger and more powerful national label. “He (Chet Atkins) played it in a classical jazzy style and we couldn’t play it like that. We weren’t good enough. So we decided to make our own arrangement of it and simplify it and that’s how that happened. Having found a local label with national distribution propelled “Walk, Don’t Run” to number two on the Billboard pop chart and sold over a million copies. When the Ventures relocated from Seattle to Los Angeles in 1963, Josie Wilson remained the band’s co-producer in tandem with Dolton owner Bob Reisdorf. Years later she was also instrumental in getting fans to demand The Ventures be inducted into The Rock and Roll Hall of Fame. During her life she became a savvy business person, a respected producer and one of the first to kick down the doors of the music industry to women. Surprisingly it was another woman-Bonnie Guitar-who grew up just a few miles north of Tacoma-who would also be instrumental in gaining respect for women in music circles. Josie Wilson remained a trusted insider of The Ventures until her death at the age of 91 in 2007. Their second release was a re-working for a 1940 Xavier Cugat hit called Perfidia. It only reached number 15 in the charts, and was followed by a steady flow of singles that stalled in the nether end of the charts; but album sales were always a more important money-maker than singles. The band would never see such spectacular single’s success aside from their 1964 re-make of Walk-Don’t Run (it reached number 15 in the US charts) and 1969’s “Theme From Hawaii 5-0” which reached number 8 in the charts. Oddly enough the theme for “Hawaii 5-0” had been written by director Morton Stevens as a short opener for the show. It wasn’t until The Ventures full recording of the song that it became a fully-formed song. The addition of horns to the song may have seemed an odd move for the band, but they utilized brass sections on and off during their career…and fans love “Hawaii 5-0″. It also didn’t hurt that they’d get a short listen to it once a week on television. 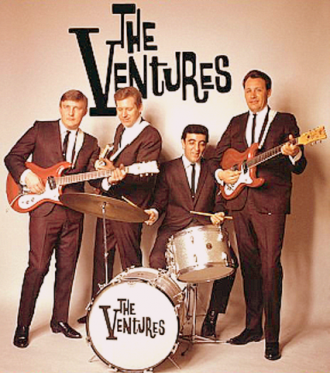 Although The Ventures would have few hit singles, they made up that by releasing hit after hit albums. They may be the world’s first band that relied on album sales rather than singles. This was unusual for the 1960s and would only become more common in the 1970s with the advent of FM radio. When Dolton Records re-located their main offices to Los Angeles in 1963 it was to the detriment of Northwest artists, but an incredibly valuable move for The Ventures. It meant better studio facilities and closer contact with Liberty Records and their distribution executives. The Ventures set the stage for a guitar line-up that has now become the typical formula; Lead, rhythm and bass guitars backed by a great drummer. The formula was not unheard of before but the band did a lot to popularize it. They’d also created “the big guitar sound” and although instrumentals were at the core of the late-50s/early 60s Northwest Sound, The Ventures were introducing a new approach that did not heavily rely on R&B and the ever-present organ. They were interested in technical advancements as well as new sounds. Over the years they would be pioneers in distortion, reversing tapes, bringing the Theramin to rock and heavy use of vibrato as well as a myriad of other effects. “Any guitar player would tell you, Bob is the most unique-sounding guitar player ever. The way he used to do the whammy bar — that vibrato bar. He kept his little finger on it while he played it all the time. He’d make it sound, like at the end of a chord, Wow-wow. Soon after the success of Walk-Don’t Run drummer Howie Johnson (a guitarist in his own right) suggested that Bob Bogle and Nokie Edwards trade places resulting in Bogle as bassist Edwards as lead guitarist. The formula worked, and the transition was amicable. It made the band more of an overall talented unit. Howie Johnson left the band in 1962 he was replaced by Mel Taylor who had been a house drummer at the well-known Los Angeles club The Palamino. Taylor had already made his mark as a drummer for Herb Alpert and as a member of Bobby (Boris) Pickett’s band who had recorded the seasonally perennial hit “The Monster Mash”. On a side note, Mel’s younger brother, Larry, became the bassist for Canned Heat and before that had been a session bass player for Jerry Lee Lewis and The Monkees among others. One of the reasons The Ventures deserve the moniker “The Band That Launched a Thousand Bands” was their release of several volumes of the “Learn To Play The Ventures” series. The learning process came to be known as “guitar phonics“. This was a completely new approach to learning guitar and bass. There had been written “how to…” books before The Ventures. There were also a few recorded tutorials. But there had never been a series of lessons by the bands players themselves to teach kids (and adults) to play specific parts of their own songs. There’s many a modern artist that proudly admit to having learned to play with The Ventures’ series. The first volume of the “Learn to Play….even showed up on the popular music charts. The Ventures were also one of the first bands to take advantage of fuzztone. Ventures afficianado’s can’t seem to agree how the fuzz was first created. Some claim it was the Mosrite guitars’ pickups they were using at the time, the Mosrite Fuzz-Rite or The Maestro FZ-1 Fuzz-Tone. No matter the source, it would become one of The Ventures signature sounds. Musicians and fans have cited their 1962 single “2,000 Pound Bee” as the first use of the fuzz guitar, but it’s clear it had been used by Ike Truner as early as 1951, on the Memphis recordings of Howlin’ Wolf (1951-52), Johnny Burnette’s “Train Kept a-Rollin” (1956) and Link Wray’s “Rumble” (1958). In 1963 the band had entered into a deal Mosrite to play live with a series of Mosrite guitars that were specially designed for The Ventures. Before the Mosrite period all three guitarists had played production models of the Jazzmaster, the Stratocaster and a Precision Bass. Mosrite founder, Semie Moseley had built a guitar that he lent to Nokie Edwards for some recording sessions. Soon Edwards had bought his own Mosrite and within a year The Ventures had an endorsement and co-distribution deal that made Mosrite a common name among guitarists. The deal lasted until 1968, and aside from the use of Mosrite guitars, there are some archival photos of the band using the Mosrite Award solid-state amps from the Ventures’ Mosrite Distributing Company. Despite their popularity with musicians this particular model would never go into mass production. It was probably Nokie Edwards who had been the most instrumental in popularizing the well-crafted series. Along with the endorsement and use of the Mosrites the guitar manufacturer sold the series to consumers with a label “The Ventures” on the headstock. It began a mini-craze for the model that remains to this day. Guitarists from Jimi Hendrix to Arthur Lee to Kurt Cobain have all played Mosrite’s. Bands like the MC5 and The Ramones have used them. According to Mosrite’s promotional material, the company claims“Jimi Hendrix had two Mosrites. Jimi would commonly smash and burn his easily replaceable Fenders but the Mosrite’s were treasured and well taken care of. The doubleneck used on Spanish Castle Magic is today on display at the Rock & Roll Hall Of Fame” They go on to say ” Virtually everyone who is anyone has owned a Mosrite at some time in their life”. This is probably closer to truth than hyperbole. Despite the quality of the instruments once the endorsement deal ended all three guitarists returned to the use of Fenders Years later, n 1996 Fender released a limited edition Ventures Signature Series of guitars consisting of their original Jazzmaster, Stratocaster, and a Fender Jazz Bass. This time the band had a hand in their design and specifications. When Nokie Edwards left the band in 1968 he reverted to his Mosrite During this hiatus Edwards was replaced by Gerry McGee and Edwards reverted to his Mosrite guitar for solo projects during this period. When he returned to The Ventures in 1973 he again played a Fender, though occasionally pulled out his Mosrite. The Ventures had also made a very savvy move in licensing their music to Japanese labels that would include Toshiba/EMI. Japan is the world’s second largest market for recorded music-The Ventures popular appeal in Japan came just as electric guitars were first being marketed in Japan- Soon The Ventures and their use of the electric guitar were in such popular demand that they began to tour extensively in Japan. Throughout their career they have been a huge draw in Japan. The move to satisfy the Japanese market would provide a boon when The Ventures became less popular in the US during the 1970s. They also recorded and released about 50 albums specifically for the Japanese market, while continuing to tour Japan on a regular basis. After the 60’s their US output did modest sales and a dedicated fan base did not diminish in Japan. The very fact that the band had never been dropped by a major label until late in their career allowed them to record and release the vast number of albums they’re known for. . They also licensed their recording to labels all around the world. The Ventures were consistent sellers no matter what label was issuing or distributing. Even poor promotion would not detract from their strong fan base. But great deals with the Japanese and European markets brought in good royalties and a savvy approach to contracts and their huge audience outside the US (even to this day) was a large part of The Ventures success even as music fans at home were turning their backs on what was becoming considered dated artists. At the advent of the 80s the Surf Sound, along with Rockabilly began to pique the interest of musicians and fans on the outer fringes of popular music. At first the interest was largely a novelty (who can forget the silly “poodle skirt” era of the 80s?) The Ventures became associated with post-modernism-a slightly jaded form of kitsch that was meant to be shared by folks supposedly “in-the-know” But as the popularity of bands like The Cramps and The Stray Cats became more serious, musicians and fans followed suit. An entire genre of “surf punk” music arose with bands like Agent Orange, The Forgotten Rebels, and of course The Surf Punks at the forefront. Many other bands would pepper their output with a surf or rockabilly song or two. Later film directors used surf music in their film soundtracks. Quentin Tarantino was instrumental in this by including classic surf tracks in his movie 1994 film Pulp Fiction. Although their profile had been rising during the 80’s The Ventures were once again on top. A new generation had found The Ventures…and took them seriously as masters of American pop culture. Sales of their old (and new) albums picked up. More and more live dates in the US and in Europe were being booked…at first in smaller clubs, but they were finding the venues were getting bigger. By the time the huge corporate-sponsored era of festivals became fashionable the band was playing in front of crowds in the tens of thousands…or even hundreds of thousands. So what of the players that have been part of The Ventures? In 1972 drummer Mel Taylor left the band to pursue a career because he felt The Ventures had become a “nostalgia act“in and was replaced by drummer Joe Barile. Taylor returned in 1979 and remained with The Ventures until his death in 1996 of cancer and heart failure. After his death his son, Leon Taylor took over his duties as drummer. Gerry McGee also left the band only to return. He walked away in 1978 to work as a solo artist as well as recording and touring with Dwight Yoakum, John Mayall, Kris Kristofferson and others. He returned to The Ventures in 1985 and is the only active remaining member left from any of the 1960’s line-ups. During a subsequent tour of Japan McGee suffered a heart attack, but recovered and continues to play with the band. Howie Johnson, the neck-braced drummer that stayed with The Ventures for their first few tours and albums passed away in January of 1988. Skip Moore who had been the actual drummer that had played on Walk Don’t Run had died in 1988. Some musicologists have argued that it was Johnson who played on Walk-Don’t Run using the pseudonym “Skip Moore”, but the evidence points a different direction. Nokie Edwards left the band a second time in 1984 to work in Nashville with Country and Western artists including lead guitar on Lefty Frizell’s final album. Edwards re-upped with The Ventures for a short time in the late 80’s but soon returned to Nashville and began a very successful career with producer and fellow musician Art Greenshaw. The critically acclaimed collaboration of Edwards and artist-producer Greenhaw has resulted in Edwards being nominated for “Grammy Award for Best Southern, Country or Bluegrass Gospel Album of the Year” with 2005’s “20th Century Gospel” andSouthern Meets Soul”in 2006. Bob Spalding has remained part of The Ventures while pursuing his own solo projects. In 2016 Bob’s son, Ian Spalding’ became The Venture’s bass guitarist. Bob now lives in San Bernardino CA. In 2015 Don Wilson retired from touring and recording with The Ventures. Since then he continues to keep the memory of the original outfit in public view. He now lives in Sammamish WA. And what of the young George T. Babbit Jr., who, at 16, was too young to play with The Ventures? Soon after his departure from the band he went to college and joined the ROTC. He then enlisted in the US Air Force and rose to the commission of 4-Star General. Between 1997 to 2000 he served as Commander of the Air Force Materiel Command (COMAFMC). On March 1, 1998, (while on active duty as 4-star general), he joined The Ventures onstage in uniform on drums. He is now living in retirement in Bremerton WA.